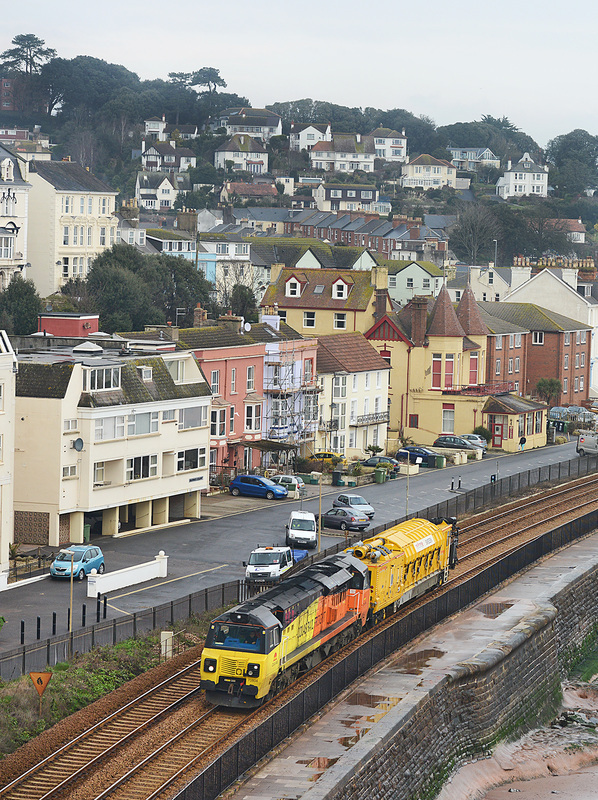 What could be described as "Professional Sucking Services" made a visit to the Dawlish Sea Wall on 22 January 2015, when Colas Rail Freight Class 70 No. 70804 powered one of the Vacuum infrastructure cleaning machines No. 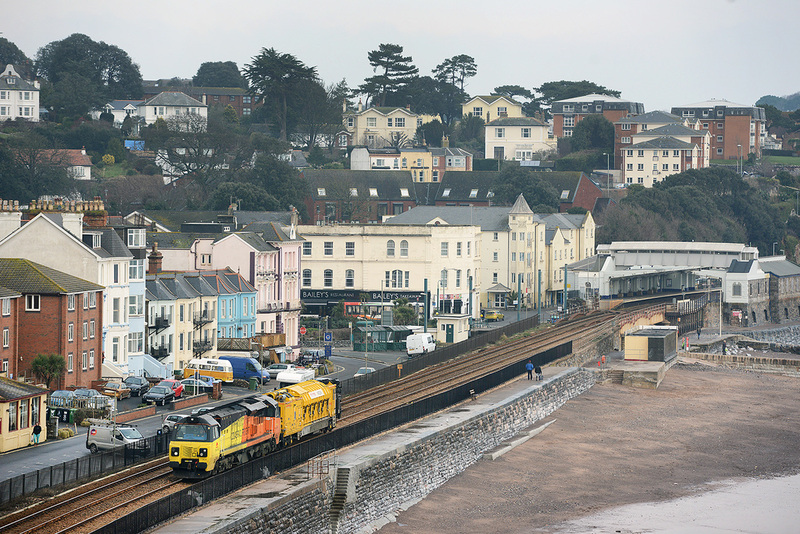 70 9515-003-0 from Westbury to Goodrington, in readiness for weekend work in the Paignton area. The train operated as 6C51, 09.13 Westbury - Goodrington via Bristol to turn the machine for its work. 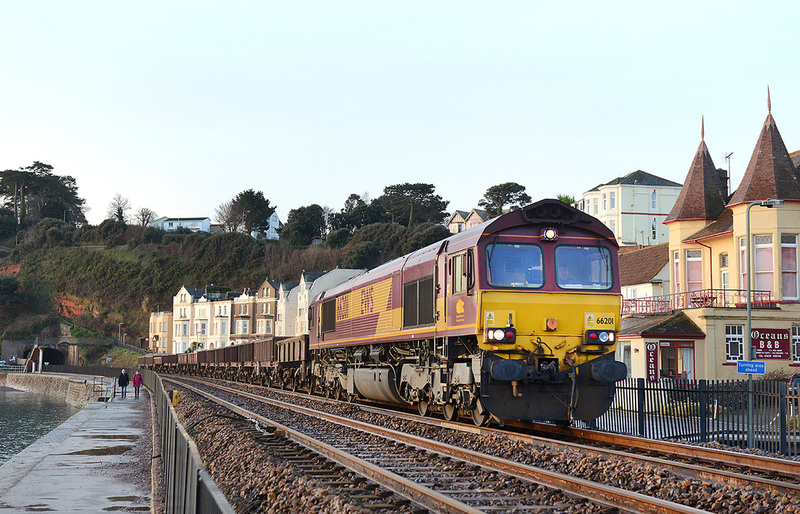 66114 up Dawlish, 6W07 08.35 Newton Abbot West Junction - Exeter Riverside. 18 January 2015. The good old New Measurement Train (NMT) powered by Class 43s Nos. 43013/014 visited Plymouth on 16 January 2015, although having revised times, the train tended to operated to its historic schedule. 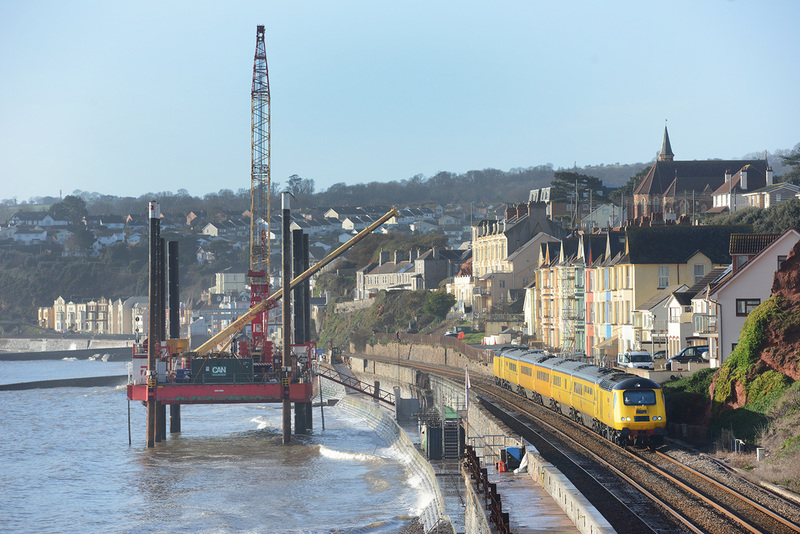 The 'up' working, 1Q19, 10.28 Plymouth to Paddington is seen passing the two work platforms on the Dawlish Sea Wall, where work has now actively started to raise the level of the lower section. FGW Class 143s Nos. 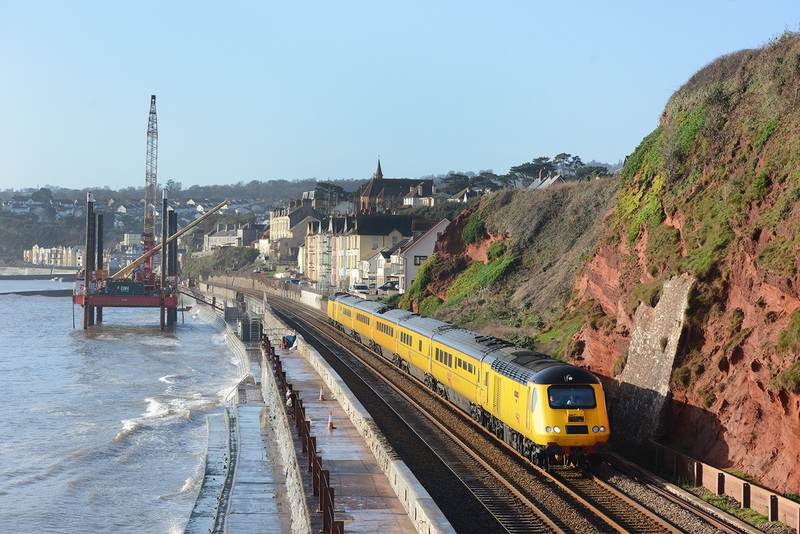 143611 and 143619 pass the sea wall rebuilding site at Dawlish on 16 January 2015 forming train 2F21, 10.21 Paignton to Exmouth. 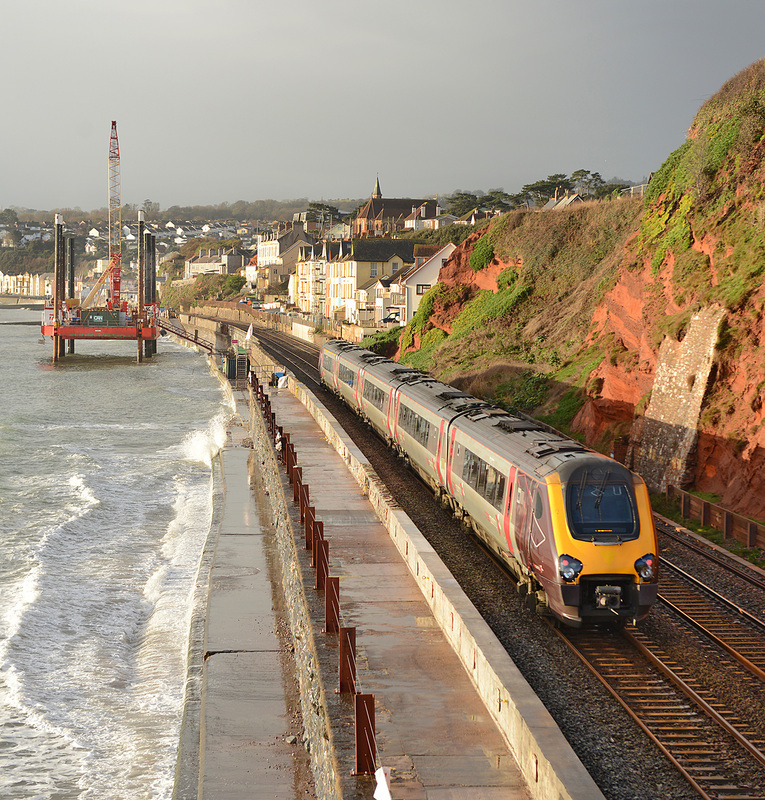 43071 and 43155 provide the power for train 1A16, the 07.41 Penzance to Paddington seen passing the work site on the Dawlish Sea Wall on 16 January 2015. 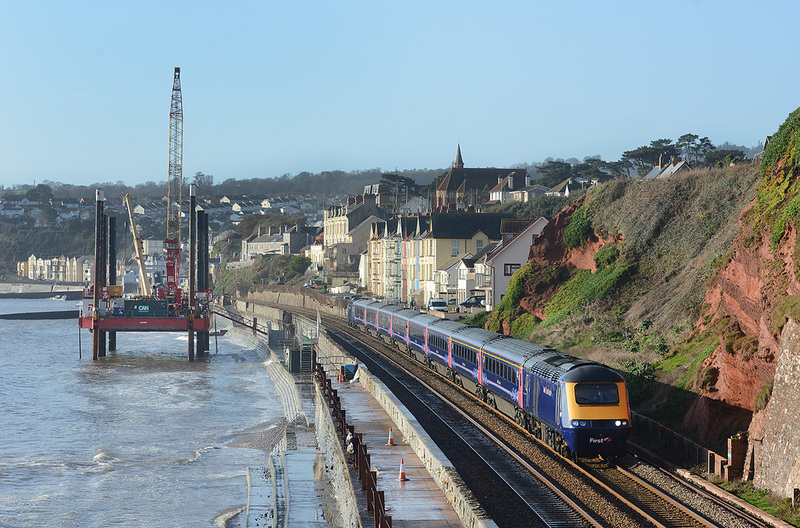 Big and little rig or work platform overtower the railway at Dawlish on 16 January 2015 as FGW Class 143s Nos. 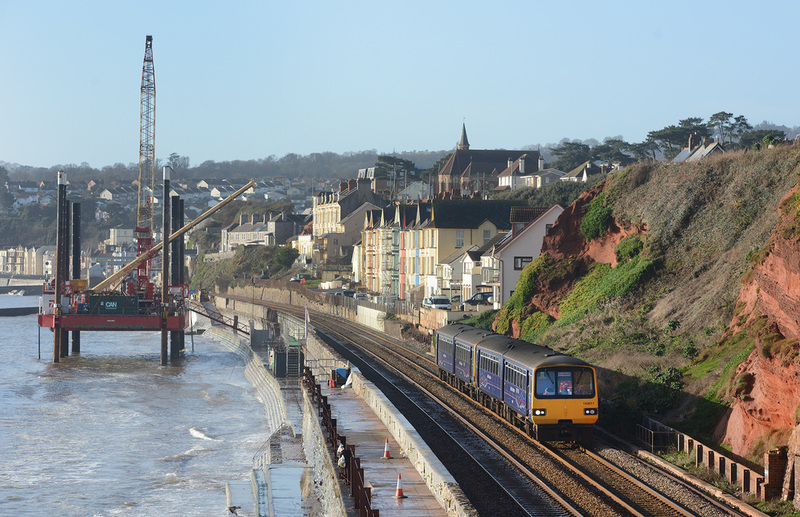 143611 and 143619 pass the sea wall rebuilding site forming train 2F21, 10.21 Paignton to Exmouth. 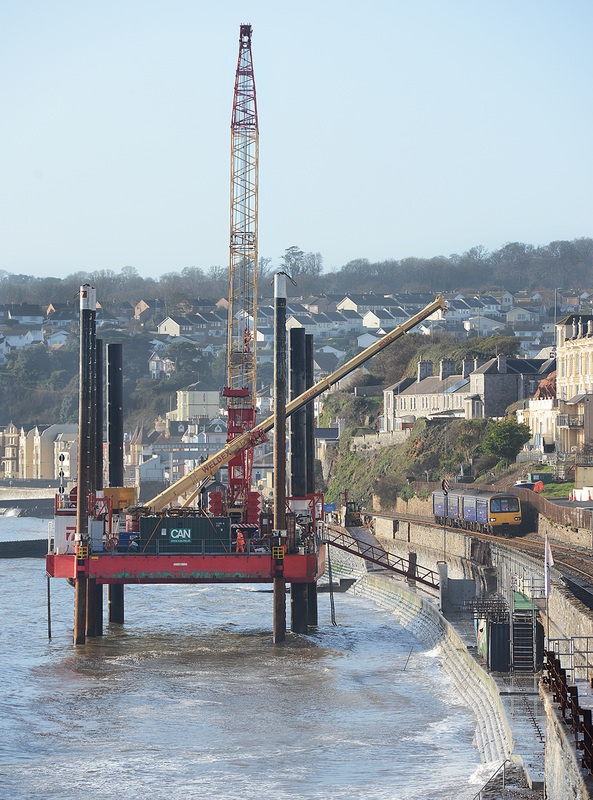 Dawlish sea wall repairs, 13 January 2014 with two work platforms in position. Early morning freight on the sea wall on 11 January 2015, DB-S No. 66201 powers train 6W10, officially the 08.27 Exeter St Thomas to Westbury which actually operated as the 08.25 Newton Abbot West to Westbury, seen emerging from Kennaway Tunnel and heading towards Dawlish station. A little early morning rising sun helped! 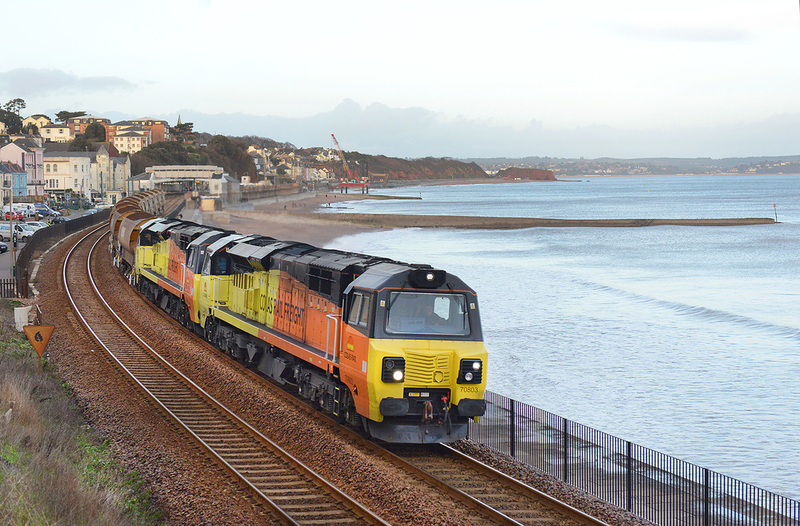 First Colas Rail Freight working on the Dawlish Sea Wall since Christmas came today 8 January 2015 when Nos. 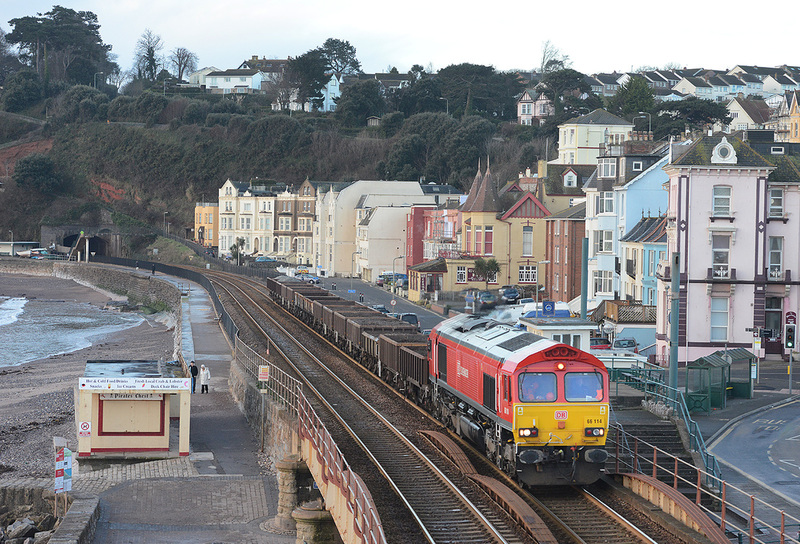 70803 and 70805 worked west on train 6C27, the 14.43 Westbury to St Blazey formed of loaded NR ballast hoppers. As the train thankfully ran around an hour early it came through is the last drops of light. 2015 has started how 2014 finished for First Great Western with continuing failures of the Class 57s deployed on the overnight sleeping car service linking London with Penzance. 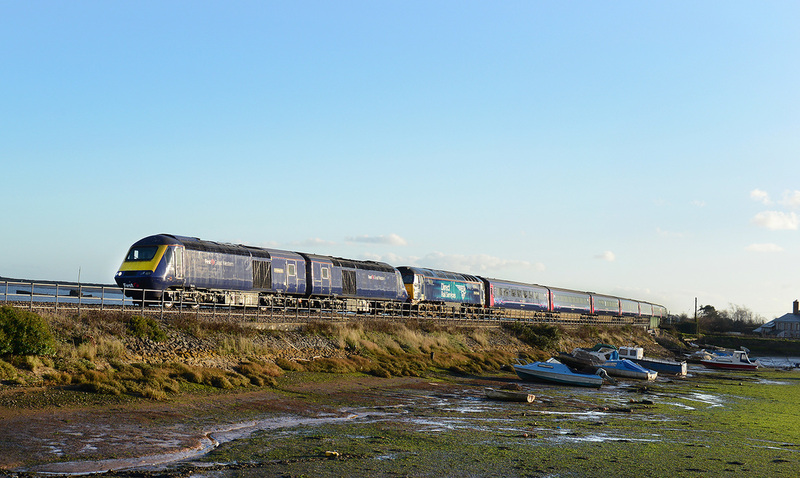 The first major 'drag' of the year took place on 6 January 2015 when the scene above was recorded crossing Cockwood Harbour, Starcross, that of 43030 and 43094 piloting failed DRS No. 57310 with the overnight train and Class 57 No. 57602 on the rear, running as 5Z40, the 14.00 Laira to Old Oak Common. This was the previous nights up sleeper which failed at Plymouth with faults on both Class 57s. 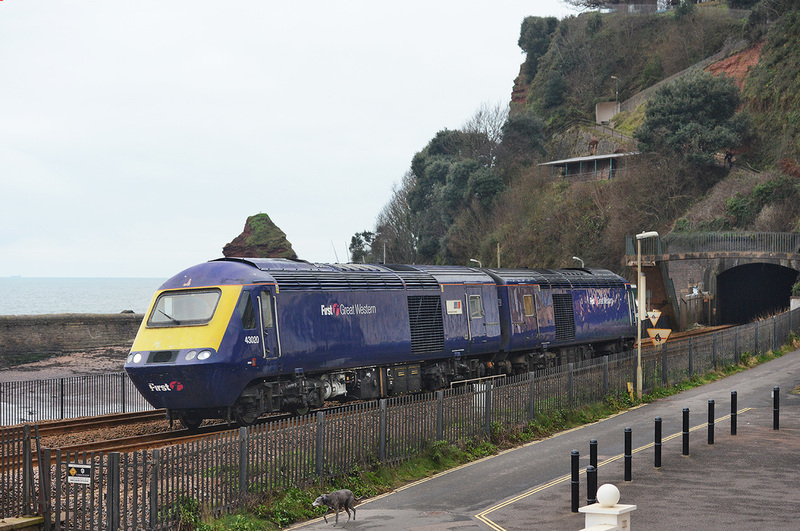 The train was terminated and restarted formed of an HST, while the 57s and stock went to Laira for repairs, however this could not be done and the entire train was hauled to London by a pair of spare power cars. FGW Nos. 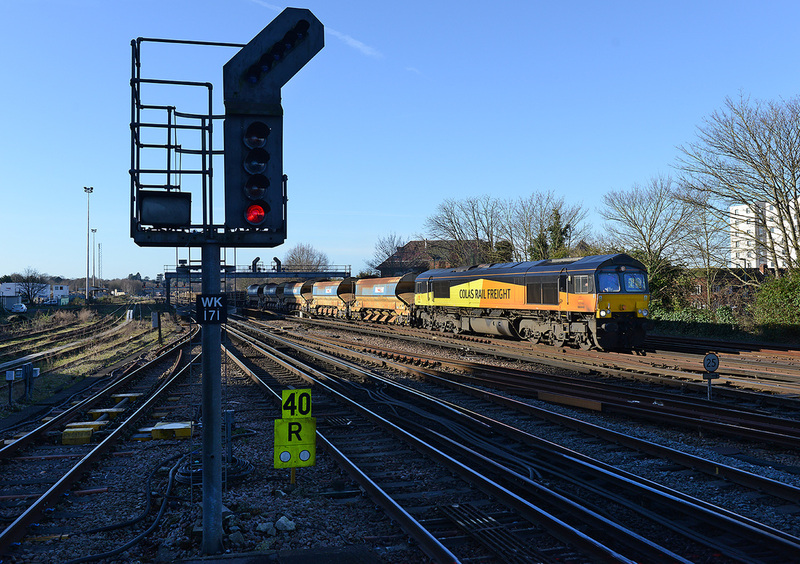 43020 and 43188 pull out of Kennaway Tunnel on 4 January 2015 forming light loco move 0Z70, 08.40 Laira to Old Oak Common.